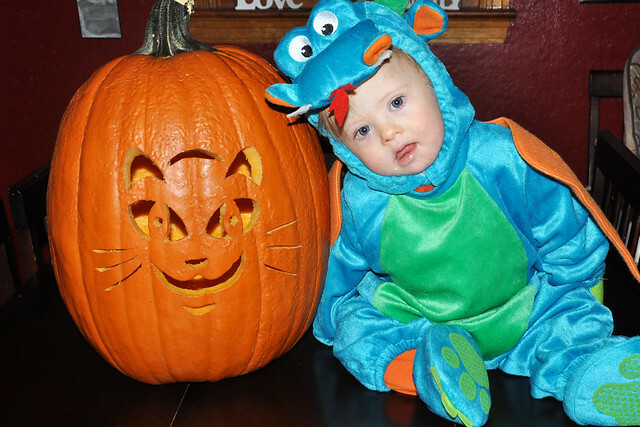 Halloween felt like a whirlwind this year! It was like I woke up, blinked, and the day was over. Even so, we had a great day! 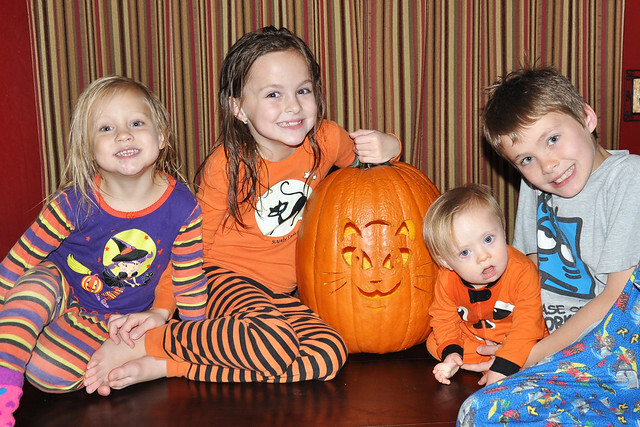 The night before Halloween, we carved our pumpkin. 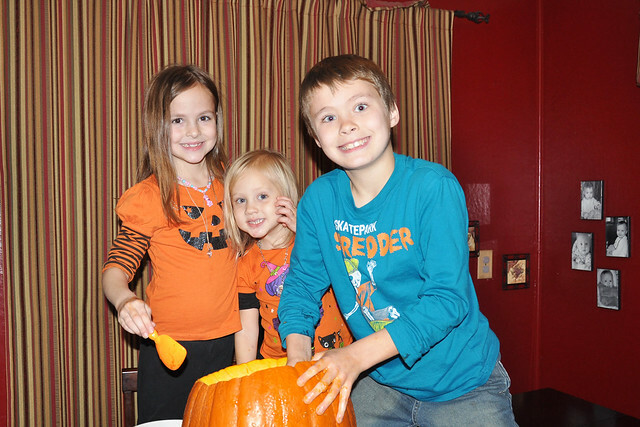 We always try to carve earlier, but for some reason, it always happens on Halloween Eve. 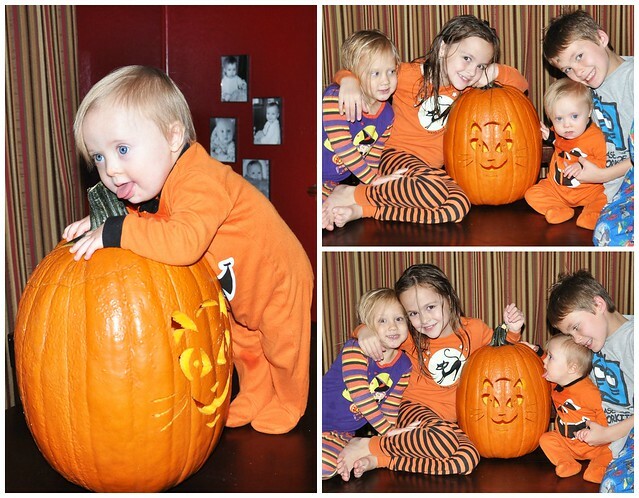 This year, we had 3 little helpers and one supervisor. Grant carved, and I took pictures. This system works out well! 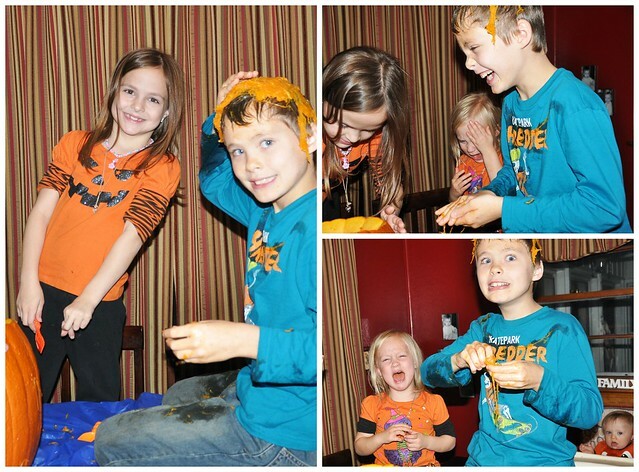 As usual, the girls were grossed out by the pumpkin goop, but Dylan happily dug in. Liam was very amused! 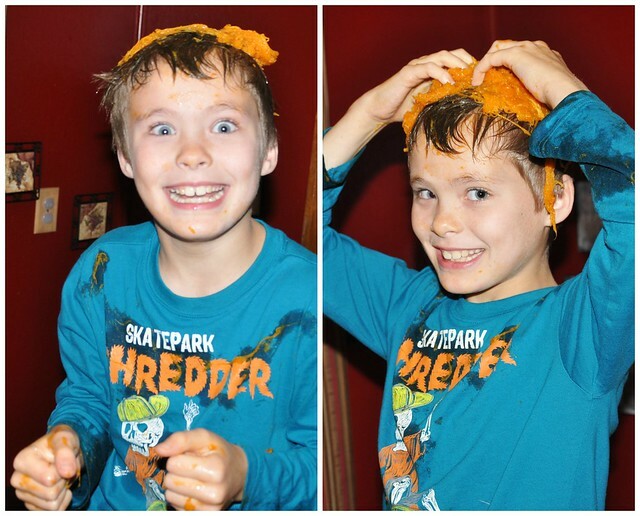 The boys tried out the goop. 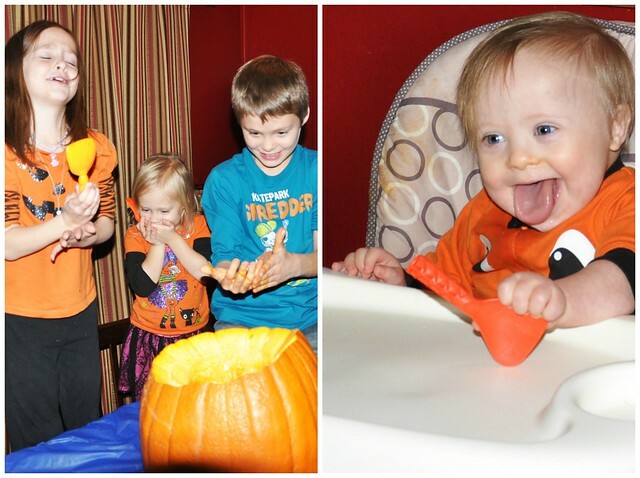 ...and teased Lily with the pumpkin touch. We sent Dylan to take a shower, but the other 3 looked cute and clean! 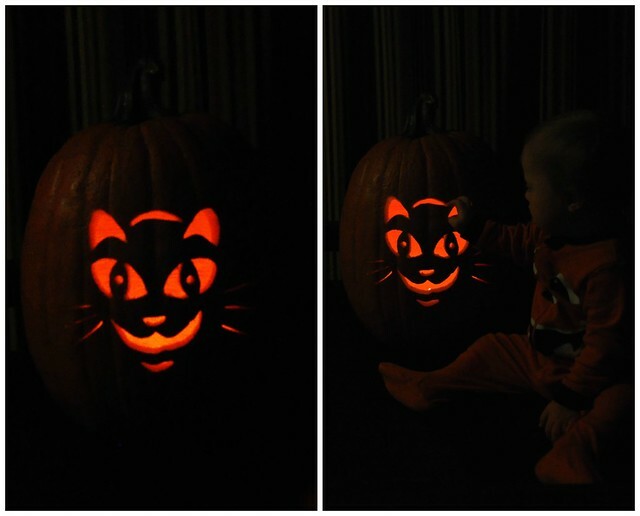 Grant did a fantastic job on the cat pumpkin that the girls requested. They all loved it! 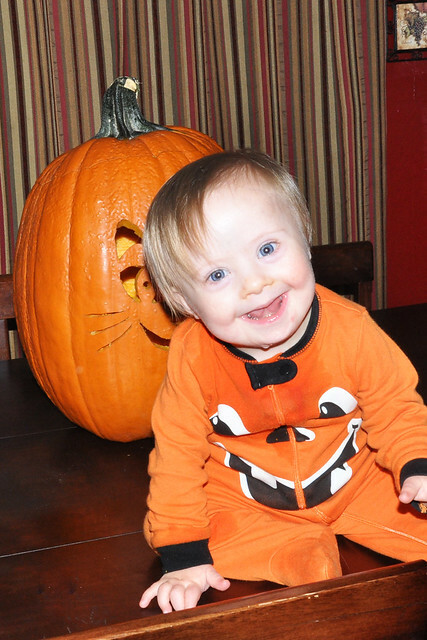 Especially our littlest pumpkin! 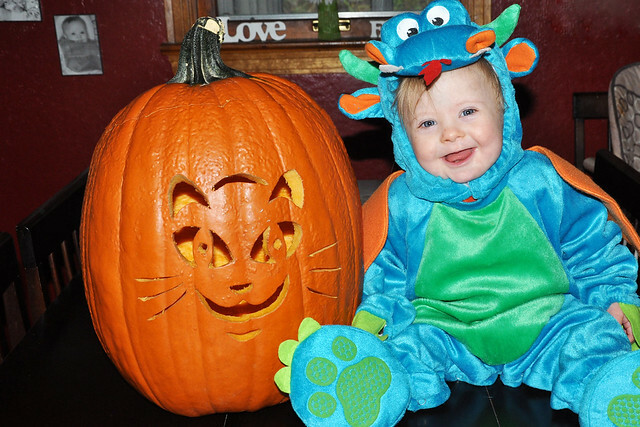 Halloween was a rush from start to finish. 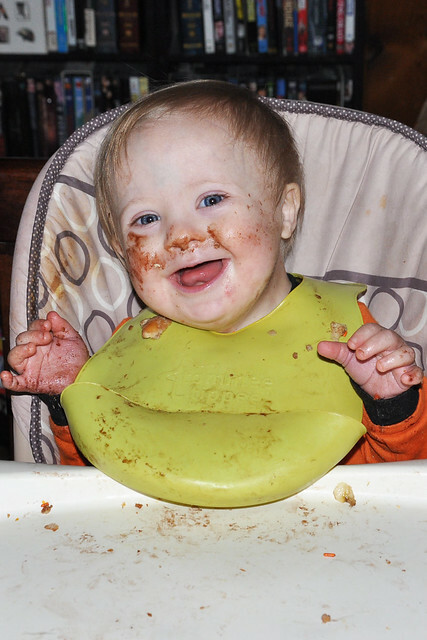 Dylan and Lexie enjoyed their Halloween doughnuts before rushing out the door for school. Lily, Liam, and I got a brief break before we had to meet a friend for lunch, run errands, and go grocery shopping and Halloween Party shopping. 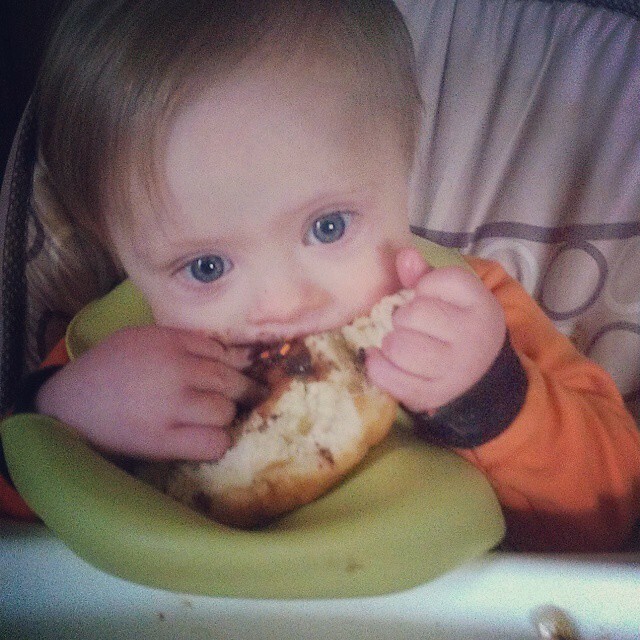 Liam thoroughly enjoyed his first doughnut! 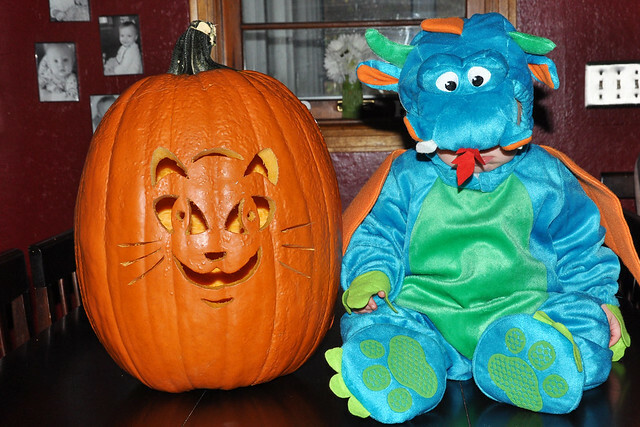 Dylan and Lexie had great Halloween parties at school. When we got home from our errands, they were just getting off the bus, and my parents stopped to visit. 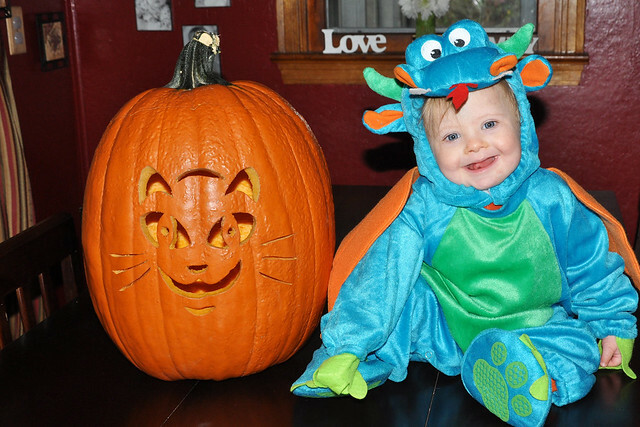 They headed home, Lily woke up from her nap, and we rushed back out the door to meet Grant at his mom's house for Trick or Treating. The weather didn't exactly cooperate. It was the third year in a row that it rained! 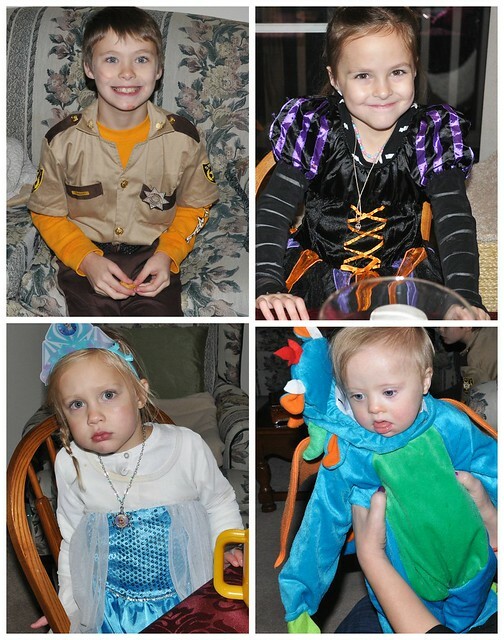 We went Trick or Treating with Grant's brother, Eric, and his family. I didn't take many pictures because it rained the entire time. 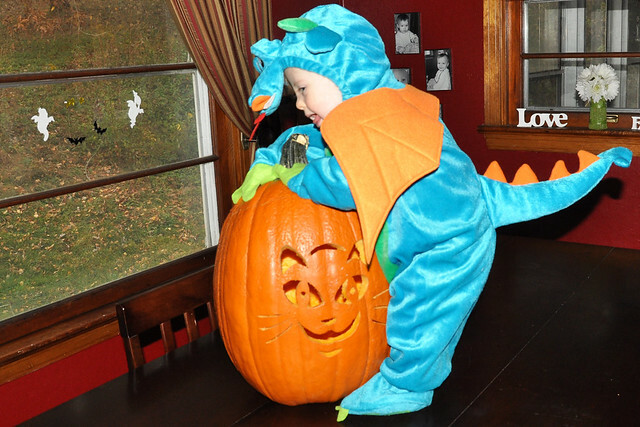 Liam slept through most of Trick or Treating, Lily wanted to Trick or Treat without our help ("Mommy, stay, I got this! 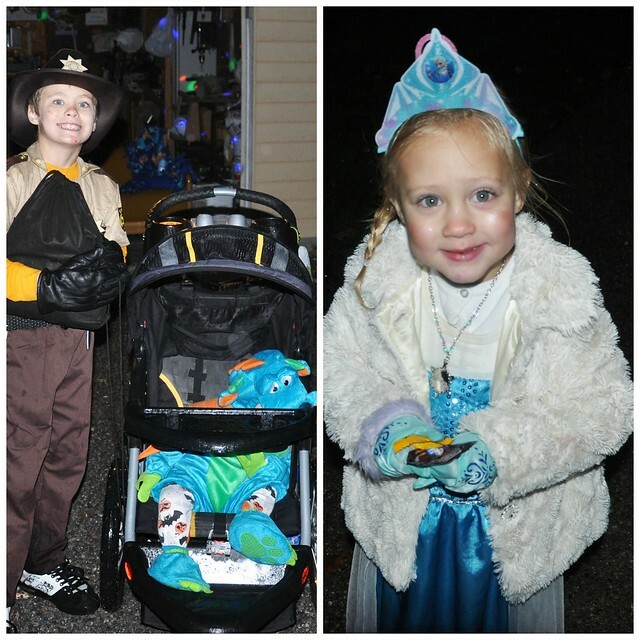 ), and Lexie and Dylan decided they were freezing and wanted to go home after only 25 minutes. Grant did take the girls back to his mom's house, while the rest of us continued. 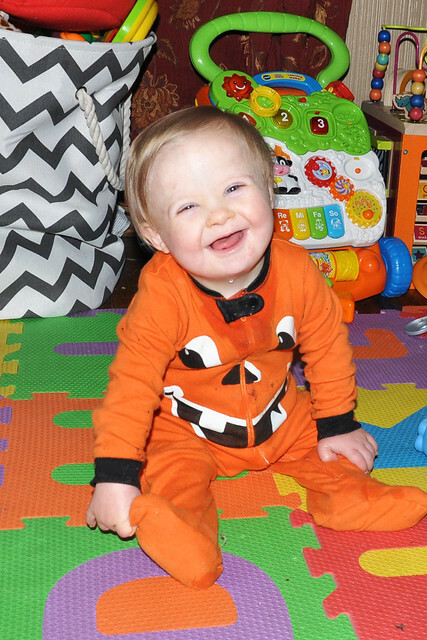 We didn't last much longer, but Liam did wake up and was able to trick or treat at a few houses before we returned to Grant's mom's house. 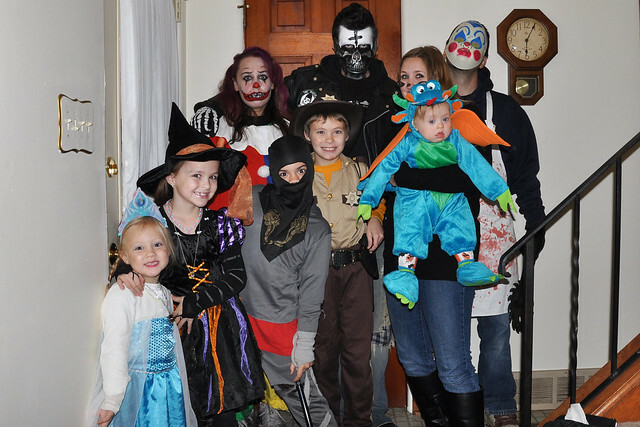 Even though they had fun at the beginning of the night, I think all the kids were relieved to be inside a warm, dry house! We're REALLY hoping for better weather next year. 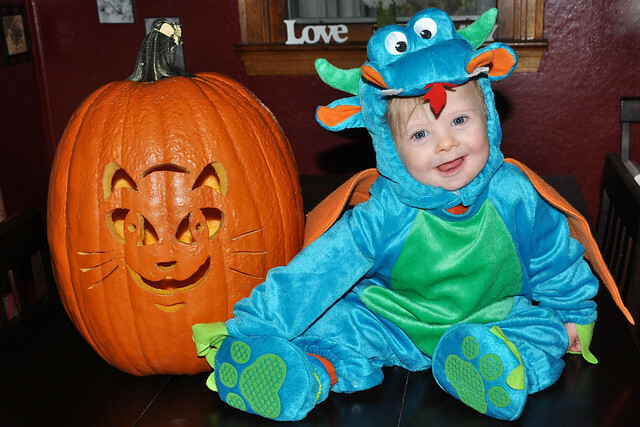 Three rainy Halloweens is ENOUGH! 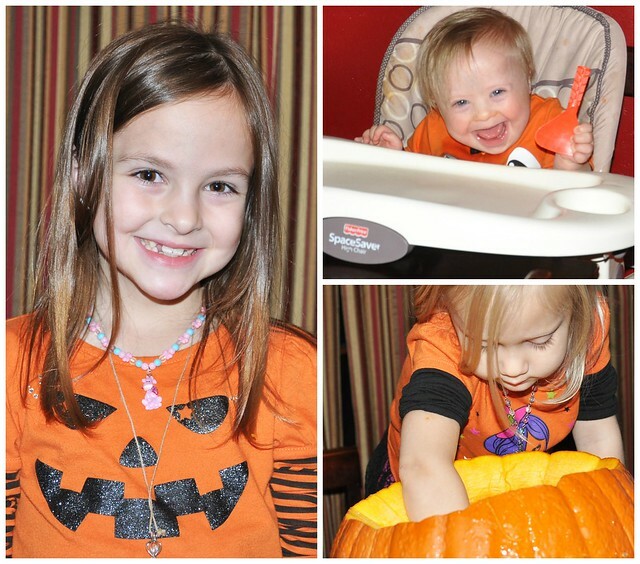 Once again, we rushed home to set up for our Halloween Party. It was very last minute, but we had fun! I didn't take a single picture. 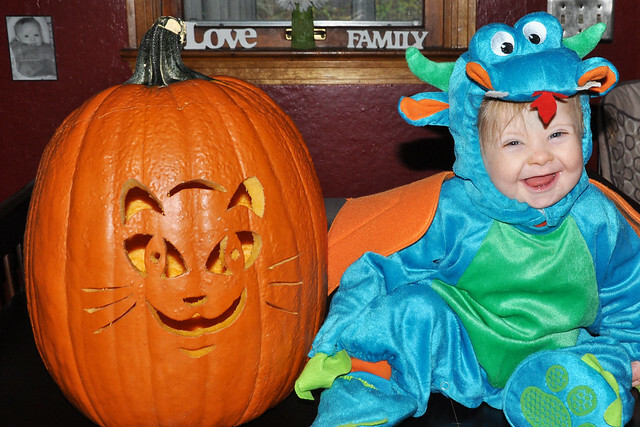 Instead, I'm going to conclude the Halloween 2014 recap with pictures of the cutest dragon EVER! It was fun, despite the rain! 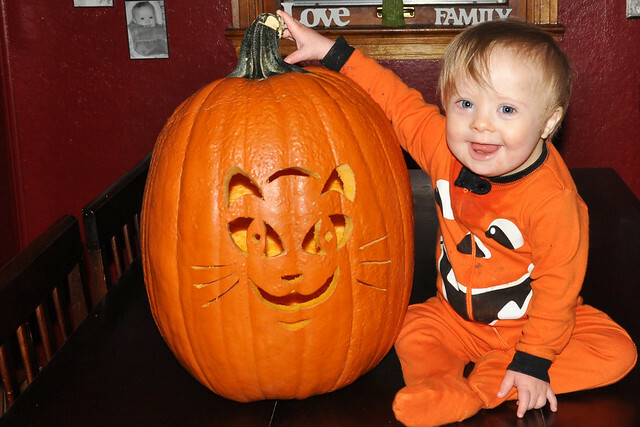 We didn't even get around to carving pumpkins this year. :( I love y'alls pumpkins and glad you didn't let the rain stop you! Thanks! 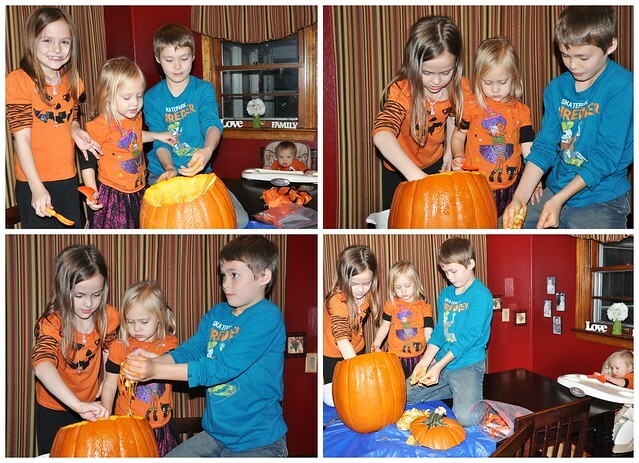 Our pumpkin carving is always last minute! When did Liam get so big?? 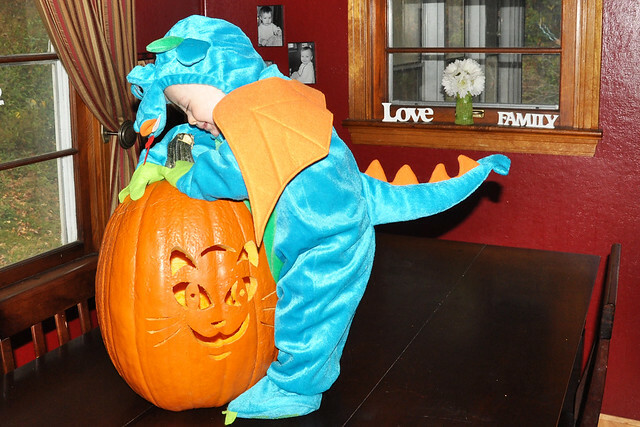 Love Dylan and the pumpking guts. why do boys find that so fun? Boys are gross at times! Liam is definitely looking older. Now if only his body would catch up! OMG - is that boy every not smiling! Too cute! And is that Rick Grimes?? Big Walking Dead fan here!! Boys always love to tease their sisters - even Aaron 3 years younger than Emma does it already! 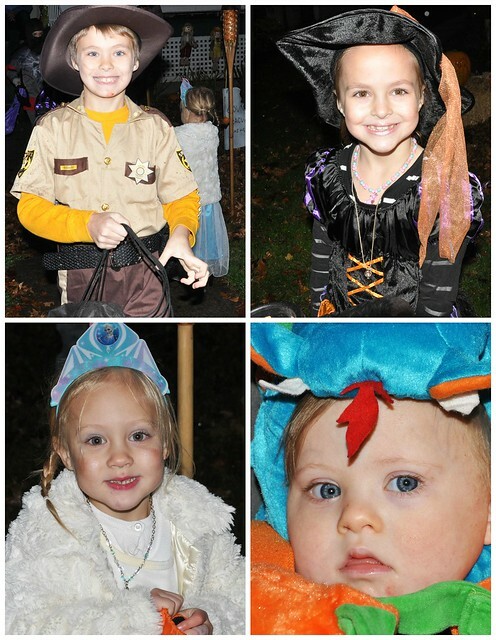 Looks like they all had a great Halloween! Now (from the title) I have the Nightmare Before Christmas song in my head! My kids love that movie! It gets stuck in my head, too! Yes, it's Rick Grimes! We love The Walking Dead! 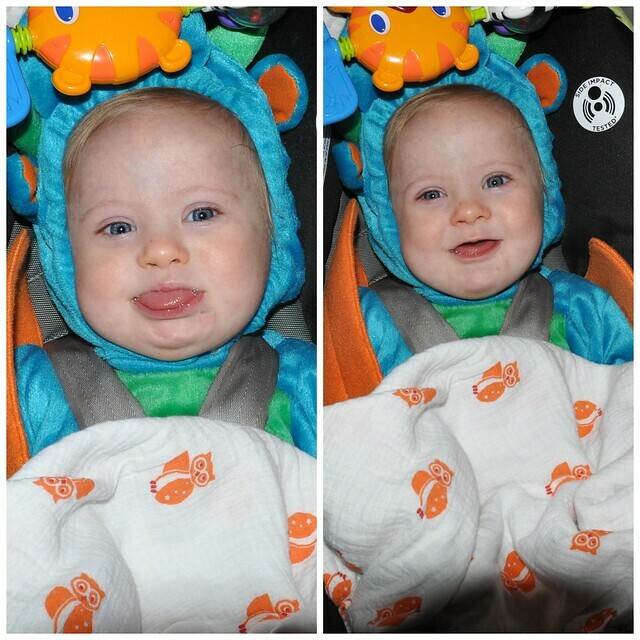 Liam smiles about 99% of the time. I wish I was that happy! They look so cute! 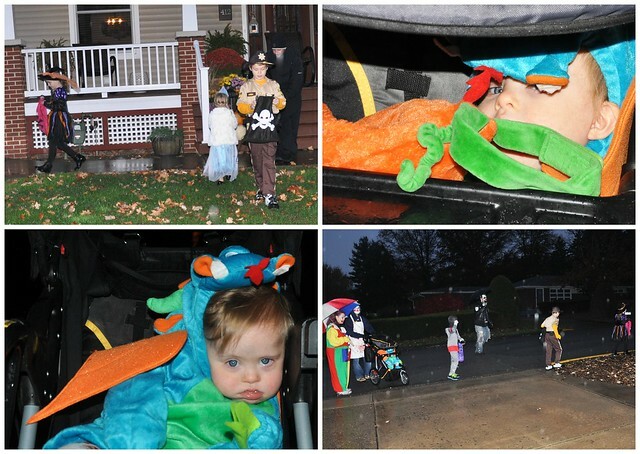 It was rainy and cold here too, and we didn't last very long trick or treating either. Maybe next year will be better! Thank you! I sure hope so! 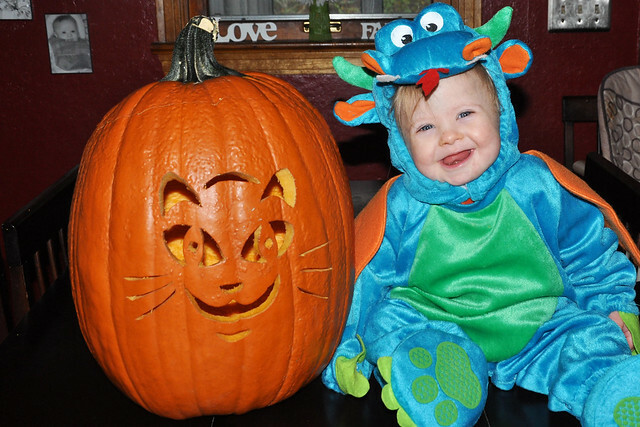 What a super fun Halloween! 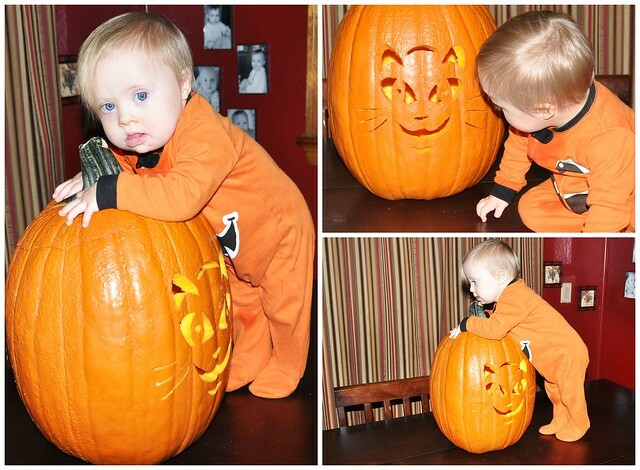 Dylan and the pumpkin - oh my! That totally cracks me up. 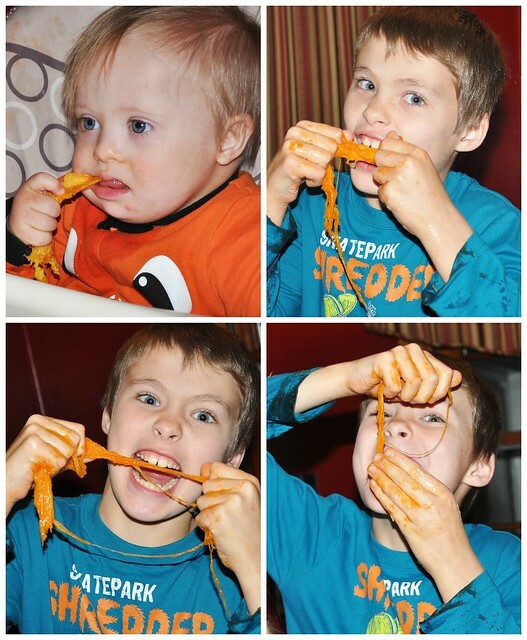 Boys can be so gross! We had a good time, even though it rained. Hoping for better weather next year, though!